A hierarchical organizational structure is a typical organizational structure. Perhaps it is the most common form of organizational structure. It follows the layout of a pyramid. In a hierarchical organization employees are ranked at various levels within the organization, with fewer, but more senior, employees at the higher levels. 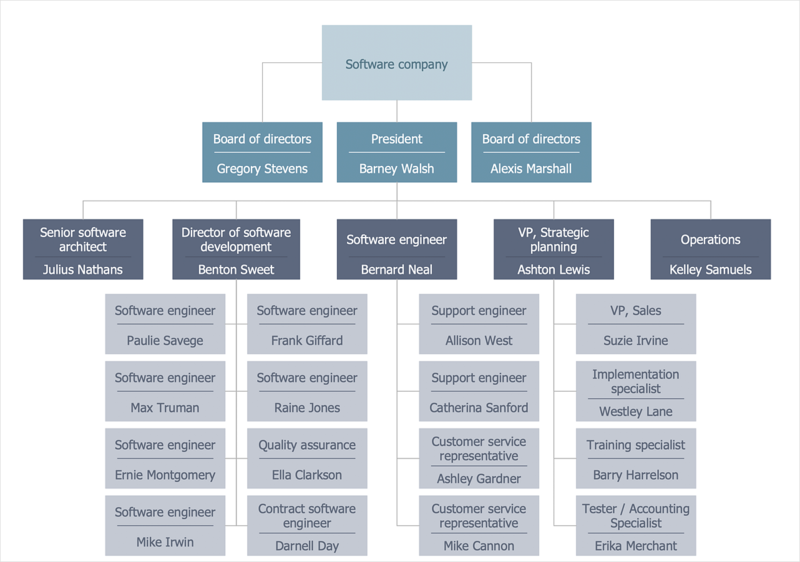 The ability to make a hierarchical organizational chart in ConceptDraw DIAGRAM is provided by the 25 Typical Orgcharts solution, available from ConceptDraw Solution Park. This solution is a paid add-on for ConceptDraw DIAGRAM It provides you with the tools needed to develop organizational charts quickly and easily, at an economical price. Select the proper "Hierarchical Organizational Chart" template from the list of templates in the Solutions panel. Transform template into your custom orgchart. Reaggange its elements by dragging them with mouse. Add additional elements from the library if needed. Next, add positions and names of employees to your orgchart. Select an object to which you want to add text and use the Select Text tool (Ctrl+T) to add text to the top and bottom parts of the object. Repeat these actions for all objects in your orgchart. To quickly customize the appearence of the orgchart use predesigned styles provided in the Format panel. Result: An effective hierarchical organizational chart helps to understand the relationships of positions at various levels within an organisation.